Offering you a complete choice of products which include automobile connecting rods. We are engaged in manufacturing and supplying Automobile Connecting Rods. This rod plays a vital role in the engine parts and requires less replacement from time to time. Also, functionality can be enhanced with proper installation and no use of faulty engine parts. To manufacture this rod, we use high quality steel forgings and follow a stringent quality test process so that international standard is maintained. Further, these rods possess the qualities like good abrasion resistance, high corrosion resistance, optimum tensile strength and longer service life. 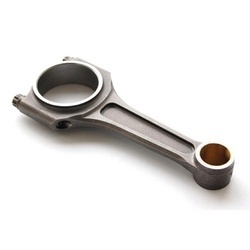 Looking for Automobile Connecting Rods ?